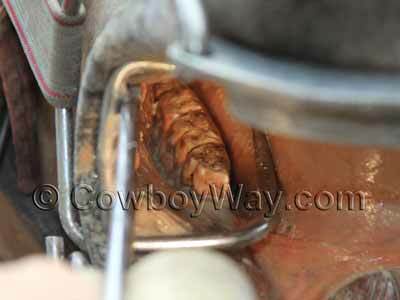 Floating a horse's teeth means to file or rasp their teeth to make the chewing surfaces relatively flat or smooth. The type of file used for this is called a "float," which is where the procedure gets its name. Below: One type of file, or "float," for smoothing the teeth of a horse. This particular float is a power float powered by electricity. Below: A different type of float. This one is manually operated and is shown in a bucket of disinfectant. Why Is Floating A Horse's Teeth Important? Unlike some other species which can properly digest food even if it is swallowed with little or no chewing, horses must chew their food efficiently in order to effectively digest it. 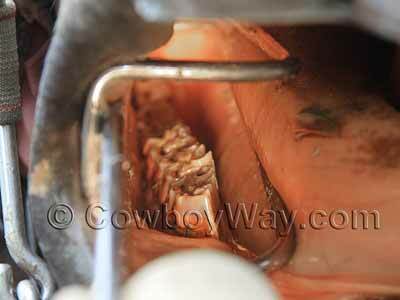 If a horse's teeth do not have a flat surface to properly chew food their process of digestion is greatly hindered. This can result in weight loss from the mild to the dramatic and poor absorption of nutrients. Oddly enough in a species like the horse where a flat chewing surface is so important, horses are prone to develop uneven chewing surfaces. This is due, in part, to a horse's upper jaw being wider than its lower jaw. This unequal width results in a natural wear pattern that causes the edges of the teeth on the upper jaw to be longer on the outside of the mouth where they overhang the lower jaw. The opposite is true on the lower jaw, where the edges of the teeth wear longer on the inside of the mouth because they extend upward to the inside the upper jaw. Below: Teeth on one side of the bottom jaw of a horse. The inside of the teeth (closest to the tongue in the center of the photo) are higher than the outside, creating an inefficient, uneven chewing surface. In addition, you can see the teeth have several sharp edges. Below: The same teeth shown above after being floated. They are now much more level, creating a more efficient chewing surface. Also, the sharp edges are now gone. Since a horse's teeth continually emerge from the gum line for most if its adult life, and because of the unequal widths of the upper and lower jaws, a horse's teeth are unlikely to grind off during normal chewing to create a flat surface. In addition to hampering a horse's ability to digest food, a horse's uneven teeth might become so uneven that sharp, razor-like edges will form. These sharp edges can cut the horse inside its mouth. Floating a horse's teeth, or at least examining the teeth to see if floating or some other care is needed, should be considered a basic part of routine care. Below: These sharp points were removed from a 10-year old mare during a routine float. These points, often called "hooks," were thin enough that they broke off when the float touched them. If they had been thicker the float would have been used to file them off. Does Floating A Horse's Teeth Hurt? No. There are not any nerves at the surface of the tooth where the floating is performed. However, that doesn't mean a horse will stand willingly for the procedure. Depending on the preference of the person performing the float and the horse's nature, some horses are sedated to have their teeth floated while others are not. When Should A Horse Have Its Teeth Floated? In years past it was common practice only for horses approximately age 10 or older to have their teeth floated. However, modern horse management has taught us that all horses, regardless of age, should have their teeth examined at least once a year. 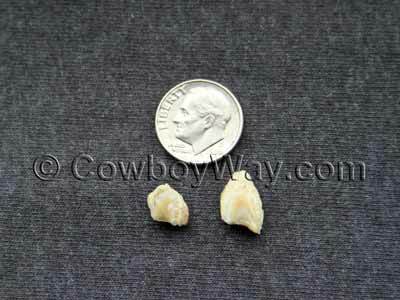 We now know it is not uncommon for younger horses as well as older horses to require floating or some other dental care. A routine examination of a horse's teeth by an equine veterinarian or other qualified person can be vital to a horse's health and well-being. 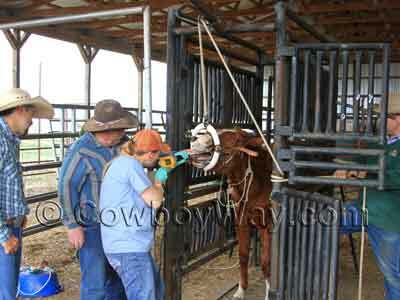 Below are several different horses having their teeth floated by three different veterinarians. Below is a Quarter Horse mare named Foxy. A veterinarian is holding her tongue to the side so he can look inside her mouth to see her teeth, and also feel them with his fingers. 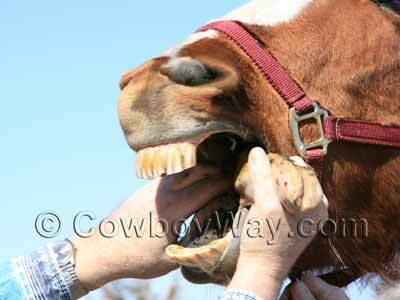 A veterinarian or other qualified professional might examine a horse's teeth in this manner or by using a dental speculum or dental wedge to hold the horse's mouth open. Please note that care must be taken when holding a horse's tongue as shown in the picture so as not to injure the horse. Below: A veterinarian looks at and feels Foxy's teeth. CAUTION! Examining a horse's teeth can be far more dangerous than it may seem, even when examining gentle horses. For example, if you reach inside a horse's mouth to feel the teeth with your fingers you can get your fingers severely bitten. 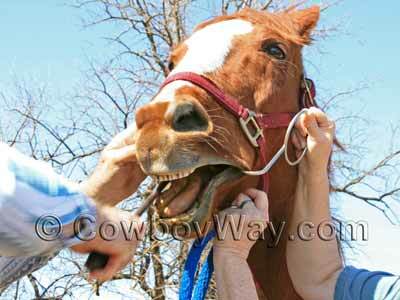 In addition, if you aggravate a sore area inside the horse's mouth the horse could react violently to the pain. If you want to learn to examine a horse's teeth be sure to learn safe techniques from someone who is qualified and experienced. To float Foxy's teeth, the veterinarian used a manual float and a dental wedge. The float was used to file the uneven and/or sharp surfaces of Foxy's teeth, while the wedge was used to keep her mouth open during the procedure. There are different types of floats and wedges. The ones used when these photos were taken are two common types. Foxy was not restrained for the procedure other than the use of a normal halter, and was not sedated. Below: Foxy getting her teeth floated with a manual float. The lady on the right side of the photo is keeping Foxy's mouth open with a dental wedge (photo of the wedge below). Here is a better look at the dental wedge in the photo above. This type of wedge is sometimes called a "spool." The spool-shaped part of the wedge is placed inside the horse's mouth between the back teeth to keep the mouth open. Below: One type of equine dental wedge. Unlike Foxy, above, the bay mare below was placed into specially made stocks to have her teeth floated. She was also blindfold and lightly sedated. The veterinarian performing the float on this horse used a "power" float powered by an air compressor, and an equine dental speculum to hold her mouth open instead of a wedge. The speculum had "bite plates" that covered the incisors. The bite plates were controlled by hinges at the side of the mouth. As the speculum was ratcheted opened or closed, the bite plates would then open or close the mouth. Although it's not clearly visible, there is also a special halter on the horse that helped to position and elevate her head. The veterinarian is floating the mare's teeth. To the left you can see air hoses going down into a white bucket where they are attached to different floats sitting in disinfectant. 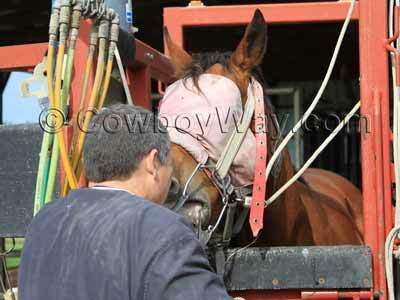 This is a closer look at the same mare above as she is getting her teeth floated. Similar to the bay mare immediately above, this sorrel gelding was placed into specially made stocks to have his teeth floated. He was not blindfolded, but he was lightly sedated. The veterinarian performing the float on this horse also used used a power float, but hers was powered directly by electricity (not an air compressor like the power float above). She was also using a speculum, not a wedge, to hold the horse's mouth open. 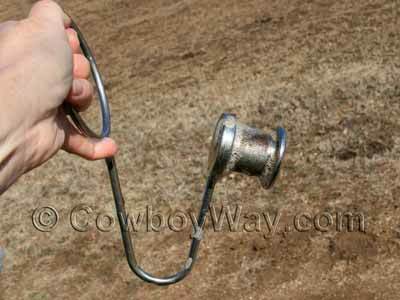 The white ring seen in the photo is an equine dental halter that helps position and elevate the horse's head. Ask any veterinarian: Floating a horse's teeth is often a popular spectator sport. Depending on the preference of the person performing the float, the owner's wishes, and the horse's nature, some horses are sedated to have their teeth floated while others are not. In the photos above the veterinarian performing the float on the first horse did not sedate her. While a little annoyed by having her teeth floated the mare generally took the procedure well, with only a little fussing. With a few pauses here and there to give her a break the procedure was over fairly quickly without serious risk of harm to the mare, the veterinarian, or the mare's owner who was assisting the vet. Another factor was that this vet used a manual float which is quieter than a power float, and therefore more easily accepted by some horses. However, some horses do not accept having their teeth floated as well as the first mare. 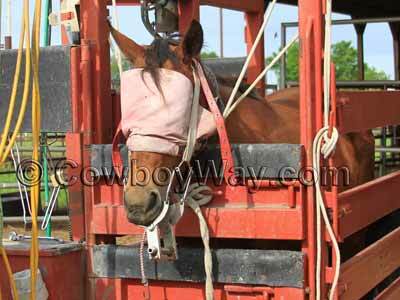 For example, the other two horses shown in the photos above were sedated for the float. The veterinarians and owners agreed that light sedation was a reasonable precaution to minimize the anxiety of the horse and/or risk of injury to the horse or humans. Two common pieces of equipment often used in floating a horse's teeth include the equine dental wedge and the equine dental speculum. An equine dental wedge (one type, the "spool" type, is seen in the photos above) is placed between the back teeth of the upper and lower jaw. 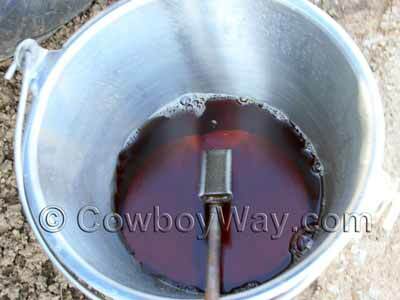 It is primarily used to keep the horse's mouth open during the floating process. An equine dental speculum has metal plates that fit over the upper and lower incisor teeth, and a ratchet mechanism that spreads the plates apart. A speculum is used to provide a more unobstructed view of a horse's mouth (when compared to a wedge), and also to keep the horse's mouth open during floating. 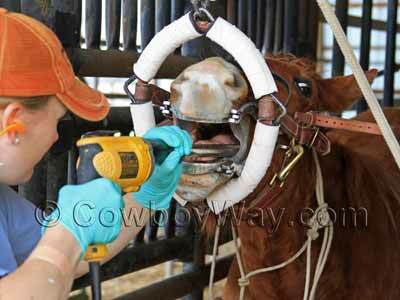 In the world of equine dentistry, each piece of equipment has its fans and its detractors. Dental wedges have been blamed for damaging the molars, while some say they have used a wedge for years with no mishaps, and merely say it must be used properly, and/or be the right type of wedge. 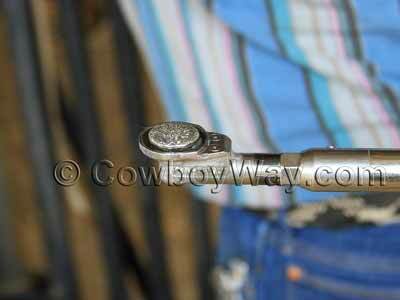 Speculums seem to be the preferred piece of equipment when compared to wedges, but we did find one online veterinarian / equine dental professional who blamed an improperly used speculum for damaging a horse's jaw. When having your horse's teeth floated it's important to ask questions of the veterinarian or equine dental professional that's doing the floating. Don't be afraid to ask them about any of the equipment they're using, the procedure itself, possible negative results, and what can be done to avoid them. While floating a horse's teeth, in general, is a safe and often necessary procedure, an informed owner is always a horse's best advocate. Bit Seat - See "performance float," below. Hypsodont - Hypsodont teeth are teeth with high crowns that slowly continue to emerge from the gum for most of the animal's life. As the top of the tooth is worn down, more tooth slowly erupts from the gum line to replace what has been worn away. Horses and other grazing animals like cattle and deer have hypsodont teeth. Malocclusion - Abnormal or incorrect contact between the teeth of the upper and lower jaws. Mastication - The process of mashing or grinding food between the teeth. For horses, mastication is the first step of the digestion process. Unlike some other species which can properly digest food even if it is swallowed with little or no chewing, a horse must efficiently chew, or masticate, its food (grasses, hay, grain, etc.) before swallowing in order to effectively digest it. Occlusion - The manner of contact between the teeth of the upper and lower jaws. Float - To file or rasp the teeth of a horse to make the chewing surfaces relatively flat or smooth. Performance Float - A "performance float" is different than a "regular" float. A performance float is when the front sides of the first cheek teeth, which are the teeth right behind where a bit sets in a horse's mouth, are floated to round them off. In some horse people's opinions this creates a more comfortable area for the horse when bitted. This is also sometimes called a "bit seat." How often do you have your horse's teeth checked? Tell us in the comments below!